Since moving to Glastonbury in 1980, I’ve always enjoyed my visits to the Glastonbury Abbey and long before I became Town Crier of this lovely town. Actually, there isn’t a complete Abbey there now, only ruins. After the carnage and mayhem seen here in 1539, presided over by King Henry VIII, clinically referred to in the history books as “The Dissolution”, Glastonbury Abbey was targeted for state robbery and destruction, its last Abbot, Abbot Richard Whiting meeting a most miserable end. He and two others, after sham “trials”, were dragged up the Glastonbury Tor and executed on the top of it. He was later “hung, drawn and quartered”. In November every year, we remember him, usually with a short service on the Tor with the laying of flowers. The last one I attended, as Town Crier, was quite moving. But the ruins nevertheless have a great appeal to tourists the world over. The massive grounds are home to quite a lot of wildlife too. My wife and I have bought yearly membership to the Abbey. We often drop in, sometimes with our grandson, and enjoy the peace and space of this historic location. Guides, in costume, are available to show visitors around. As happens every year, the Mayor, Town Clerk, Macebearers, Town Councillors and myself are invited to attend two big Pilgrimages. One is a Roman Catholic Pilgrimage the other, an Anglican one. Sometimes they occur in the same weekend. My parade associates refer to these as “Back-to-back” Pilgrimages! 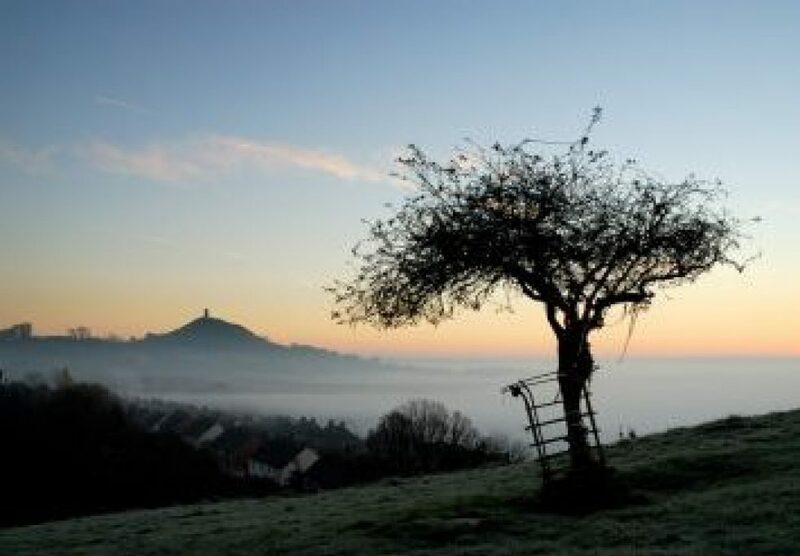 They are significant events in the Glastonbury Calendar and attract thousands of worshippers and spectators. Slow processions through the streets of Glastonbury also take place. 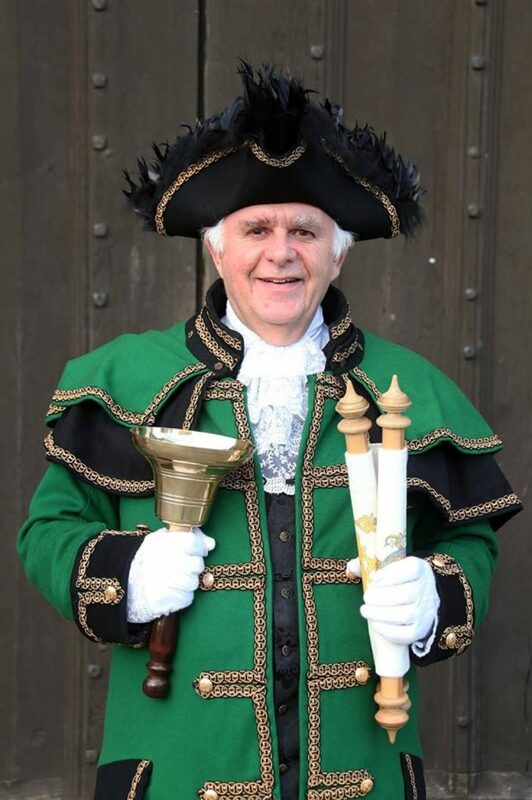 But this year, I had two other Town Crier jobs in the Abbey. Firstly, I was contacted by a gentleman called Nico, who wanted me to “cry” at his engagement. His plan was to “pop the question” to his good lady in the grounds of Glastonbury Abbey and then to have the local Town Crier, standing by, to shout out the glad tidings, if she said “Yes”. What an inspired decision, I might add, to utilize the Town Crier! After the initial contact and explanation had been made, a flurry of secret text messages followed concerning the date, timing, exact location and my “choreography” before crying. When the big day came, I parked in my usual spot that’s reserved for me when on “Civic Duties”, just behind the Town Hall, which is conveniently next door to the abbey. As I was climbing into my regalia, a lady passed by and said, “You’re hear for the engagement then?” I nodded. Clearly, Nico’s plans were not entirely top secret. Once robed up, I flashed my yearly entrance card at the girl in the foyer, before making my way towards the outdoor café in the Abbey grounds to try and be as inconspicuous as possible – well as much as a man wearing frilly lace, white tights, buckles on shoes, triangular feathered hat, an eighteenth century great coat, yards of gold braid and shining brass buttons can be! It was a good spot with a clear view of the planned “Engagement Zone”. I stood and watched. My good friend Ali passed by -she happened to be visiting the Abbey at the same time – and she kindly agreed to take a few photos of the events as they unfolded. We took the obligatory selfie. We watched carefully. After about ten minutes I was beginning to feel that the Vicky had decided to shun married life with Nico by replying negatively to his question. Then suddenly, in the distance, there was a flurry of activity. I could hear and later see a solo violin playing near some steps, joined shortly after by a lone guitarist. The melodious music wafted across the lush green grounds. Then I saw the couple. He was reaching for the ring!! I said to myself: “This guy will go far! He’s chosen Glastonbury Abbey, arranged some live background music and even booked a Town Crier….this chap has got it well and truly sorted!” Ali felt much the same. The big question was this. When do I advance prior to a Town Crier announcement being made? We waited and watched. Then I saw the smiles, hugs and long passionate embraces – all the clues I needed to step forward and introduce myself to the blissfully happy couple. It was a delight to be the first to congratulate the newly-engaged couple and to kiss the lucky bride-to-be. I spun round, took a few paces forward, unrolled my scroll, took a deep breath and announced their good news to passing visitors and a professional photographer who had also clearly been hired, to photographically capture the event! As I said, this chap did it with style! A rather similar secretive stream of messages and texts between myself and my very good friend, Heidi, preceded my appearance at the Abbey to “Cry” at a 25th Wedding Anniversary party a few months later. Again, I lurked in the grounds of the Abbey until being summoned to spring a surprise on the couple and their guests with a “Proclamation”! That’s one of the terrific things about being a Town Crier – I’m often able to share in the happiness and joy of others. It’s the best job in the world! You are so lucky to live and work in such a wonderful place as Glastonbury!